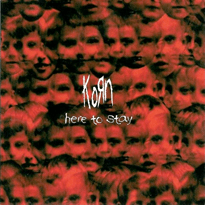 "Here to Stay" is a Grammy Award-winning song by American nu metal band Korn that appears on the band's fifth studio album, Untouchables as the album's opening track. It was released as the album's first single in February 2002. The song won the 2003 Grammy Award for Best Metal Performance, as well as winning an award for Best International Video on MuchMusic in 2002. It was also nominated for Best Rock Video at the 2002 MTV Video Music Awards and Best Single at the 2002 Kerrang! Awards. The music video, directed by The Hughes Brothers was highly successful, and gained frequent airplay on MTV and MuchMusic in particular, featuring the band members on a TV screen amongst major world issues at the time. The video won a 2002 Metal Edge Readers' Choice Award for Music Video of the Year. The song has become a staple of the band's live show to this day. "Here to Stay" was released to US radio stations in February 2002 as a promotional single. The retail version was released on the same day as Untouchables, June 11, 2002. A box set was later released, which included all three editions of the "Here to Stay" single. There is also a one-track promotional single of the Mindless Self Indulgence remix, which is difficult to find. This remix is also found on the DVD single of "Thoughtless". Electronic musician BT also remixed the song that same year. In the concert version of the song, small changes are made to the song, such as the guitar riff played by Head in the background being removed during the outro of the song. The line "fucked up feelings again" in the pre-chorus of the song is often left for the audience to sing instead of Davis while rest of the band members momentarily stop playing their instruments in order to hear the fans' voices more clearly. The music video portrays a boy watching subliminal messages on TV while flipping channels between shows (which consist of real-world events) and the band playing in the TV against a static backdrop. In the end, Davis takes the boy into the TV. The video for "Here to Stay" also marks the first video appearance of Davis's unique microphone stand designed by H. R. Giger. There is also a "clean" version of the music video which shows the boy being taken into the TV at the beginning. This version omitted the explicit words and all of the real-event videos. The point of view is "inside" the TV instead of outside it. This version is the one shown at Sony BMG's official YouTube channel. The song is featured on the soundtrack to the 2002 video game ATV Offroad Fury 2. Featured in the adverts of the Spanish TV channel Cuatro, during the UEFA Euro 2008. In the adverts, some players such as Fernando Torres and Iker Casillas are shown fighting with robots to win the ball. A small sample of the beginning of the song (the main riff) can be heard at the end of the advert. Professional boxer Kelly Pavlik used the song as his entrance music. American sports channel NESN used the intro of the song on a highlight reel. 1 2 "Korn > Charts & Awards > Billboard Singles". Allmusic. Rovi Corporation. Retrieved 2011-02-16. ↑ Zywietz, Tobias. "Chart Log UK: Alex K - Kyuss". Zobbel. Retrieved 2010-02-16. 1 2 "Here to Stay - Korn". Billboard. Prometheus Global Media. Retrieved 2011-02-16.